The VRT series sets the new standard in applications requiring extremely high torque density and rigidity. 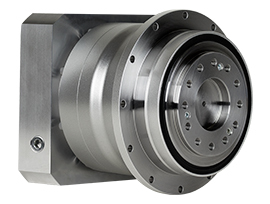 Its compact design and robotic industry ISO flange is ideal for equipment requiring high speed, high precision indexing movement and streamlined installation. The remarkable torsional stiffness and ultralow backlash combine to provide outstanding positioning accuracy. NOTE: For an explanation on the Adapter Flange Code, please review the Adapter Flange Codes tab section. These tables provide an explanation for the adapter codes. The tables start with Input Bore measurement and the Part # Code, which are indicated at the end of every model code. For each Part # Code, the Pilot, PCD, Tapped Hole, and Pilot Depth, are explained.